Footballers wives can now enjoy larger families. Afzal Kahn has now given the Discovery 4 the A. Kahn treatment enabling up to seven to travel in the same exclusive vehicle at the same time. The purpose of the vehicle has been completely redefined. 22" RS-R wheels ensure this is one Discovery that will never venture off road, nor is likely to take well to speed humps and speed cushions on the school run. Instead, it substitutes the usual fare of Ferraris and Aston Martins with a 7 seater showboat as at home on the motorway or the coastl highway in Dubai as outside Harrods or in the Inflite private charter jet carpark. The new Discovery's, extended contour is immediately recognisable with a tasteful styling package consisting of front and rear arch spats, front and rear bumper unit, twin mesh grille, side vents, L.E.D running lights, lowered sports and exhaust system and privacy glass. Inside is the 'bespoke touch'. 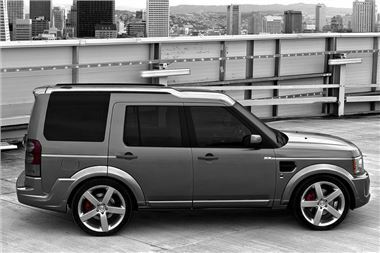 A. Kahn Design allows customers the opportunity to express their individuality. They can have whatever they want, designed with an exterior and an interior to suit the exact specification of the customer. All A. Kahn vehicles are built with the same philosophy that only the best is good enough and that customers should not have to submit to the conformity that the mass produced car market places on them.